Roulette’s powerful 12-channel soundsystem is the common denominator of this year’s Mixology Festival. Each evening groups artists with a roughly similar approach, yet each offering a unique perspective on sonic space. The theme in all cases is immersion; participation through active, physical engagement with the medium. Greg Fox is a New York City born-and-bred drummer, multidisciplinary artist, and teacher. He has played on and released 49 records since 2008, including his work with Liturgy, ZS, Ben Frost, Colin Stetson, Skeletons, Hieroglyphic Being, Man Forever, and others, as well as with his own solo work and his projects GDFX and Guardian Alien. Fox has toured worldwide with various groups and collaborations, held residencies at Clocktower and Pioneer Works, and was awarded “Best Drummer in NYC” by the Village Voice in 2011. Fox uses a hybridized electroacoustic drum setup to explore new dimensions through the traditional gestures of the modern drummer and the possibilities inherent in electronic and computer music. 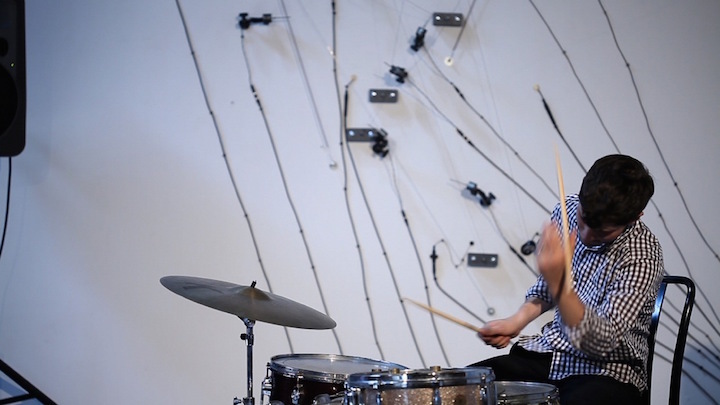 Eli Keszler is a New York-based artist, composer, and percussionist. His compositions and visual works examine the limits of instrumentation, notation, and space in its institutional, musical and public form. Keszler’s sound installations, music and visual work have appeared at Lincoln Center, MIT List Center, SculptureCenter, The Kitchen, MoMA PS1, and more. Keszler has released solo records for ESP-Disk and PAN, and most recently released Sounds of Speed on Empty Editions from Empty Gallery in Hong Kong. Keszler is a graduate of the New England Conservatory of Music in Boston and a 2016 NYFA Fellow. Mario de Vega’s sound installation Target ZIP Code (Zone Improvement Plan), which features the exhibition space translated into a frequency value, will be on view each night throughout the festival. Exploring the physicality of listening and the threshold of human perception, Mario de Vega researches the materiality of sound, the vulnerability of systems, materials and individuals, and the potential of unstable systems.